Wikipedia: "USS Chillicothe was an iron-clad river gunboat of the United States Navy. She was named for the capital of Ohio from 1803 to 1810. Chillicothe was laid down at Cincinnati, Ohio. 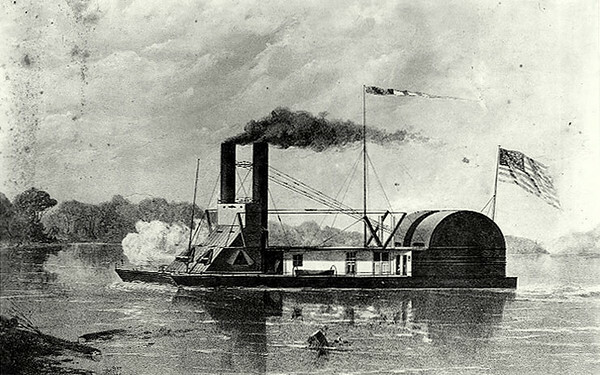 She was commissioned on 5 September 1862 at Jeffersonville, Indiana, with Acting Lieutenant J. P. Sanford in command. Necessary alterations and repairs and lack of sufficient water to pass over the falls detained her in the Ohio River until early January 1863." War Department records (now maintained by the National Archives) show that adoptive 2nd great grandfather William Donaldson served aboard her for about a year as a Gunner's Mate, until he was invalidated from Navy service due to a back injury.